June 14, 2016 By Elizabeth Lindemann 11 Comments / This post may contain affiliate links. 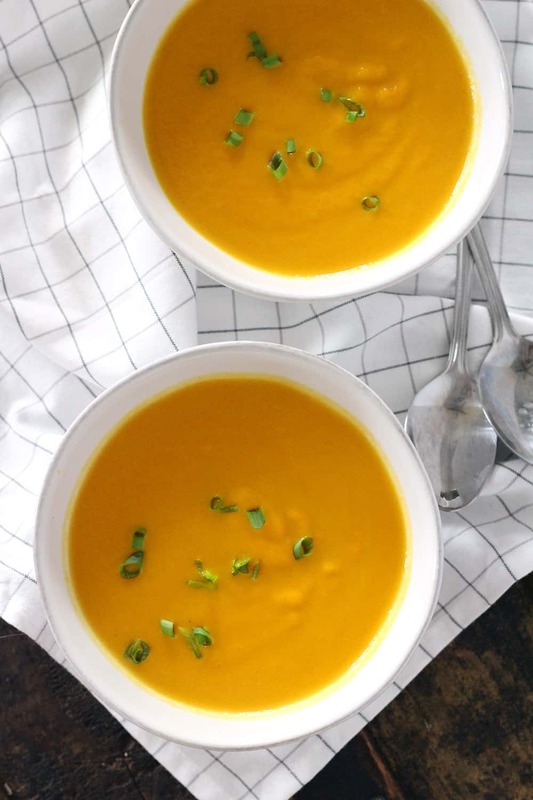 This Carrot Ginger Soup is a dish best served hot. Or cold. Whichever you want! Which makes it absolutely perfect for any time of year, even on the hottest of summer days. Goodness, this is tasty. And extremely healthy. There’s a whole pound and a half of carrots in this recipe, with only four servings. That may seem like almost too many carrots per serving, but when they are cooked to smithereens and pureed to a silky smooth texture, it’s easy to eat a ton of this super healthy veggie. Their natural sweetness is enhanced by cooking, and they pair so well with fresh minced ginger and just a teeny bit of orange zest to give this soup some zing. It’s velvety smooth, buttery, and deliciously simple. will do the trick) to remove any dirt. I do find that leaving peels on carrots will impart a very slight bitter taste, but don’t worry- the soup will still be delicious! 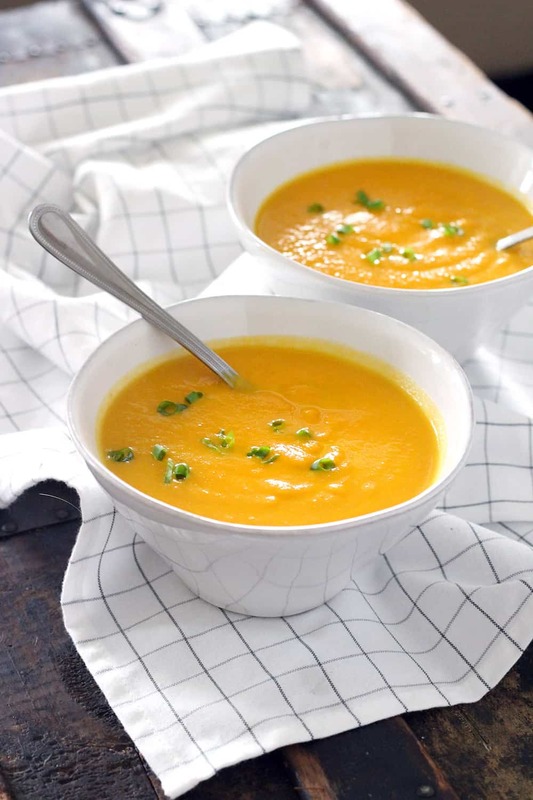 You can puree the soup two ways: in a blender in batches, or using an immersion blender. I highly recommend the latter. An immersion blender, otherwise known as a stick blender, just submerges right into the soup pot to puree, rather than having to lug a huge appliance out (and thus clean said appliance). It’s one of my most loved kitchen gadgets. In order to get a very smooth result, I recommend holding the blender at a slight angle from the bottom of the pot. If this causes it to sputter, just tilt the pot so the soup is deeper where the blender is. This will speed up the blending process and make sure every morsel gets pureed for the smoothest, creamiest consistency. This soup is Whole30/Paleo compliant (just use ghee instead of butter), and vegan if you use vegetable broth instead of chicken. The inspiration for this recipe came from Simply Recipes. 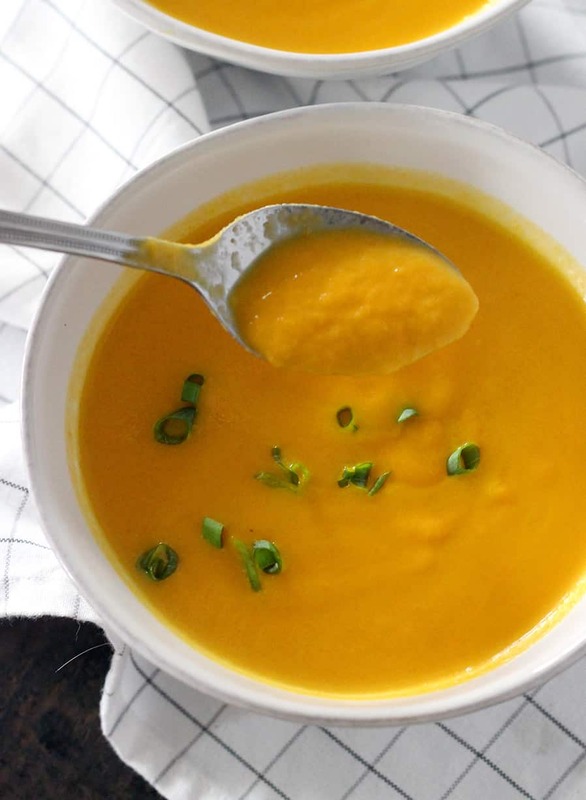 Velvety smooth, healthy, easy, and delicious, this carrot ginger soup can be eaten hot or cold, making it perfect for every season! Whole30/Paleo, vegan, and packed full of nutrients. Saute the carrots, onion, and salt in melted butter over medium heat until softened (let them sweat, but don't brown), about 10 minutes. Add the ginger, orange zest, stock, and water. Bring to a boil, then simmer for about 20 minutes (or until carrots are tender). 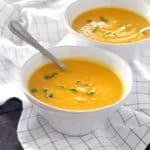 Use an immersion blender to puree the soup to desired consistency (alternatively, you may do this in batches in a traditional blender). Check seasoning and add salt if needed. Garnish with green onions or herbs, if desired. If you want the soup chilled, refrigerate for about two hours before serving. Make a double batch and freeze it for up to 6 months in an airtight container. For a vegan version, use olive oil instead of butter. Currently making this for the sixth time since discovering it last month… aboslutely delicious, thank you! Yay! So happy you like it, thanks so much for the comment ???? Deeelicious – butter isn’t vegan though! Just found this — I started making butternut squash soup – (including carrots and celery) but was minus the apple so just added the ginger, orange zest and a little nutmeg. 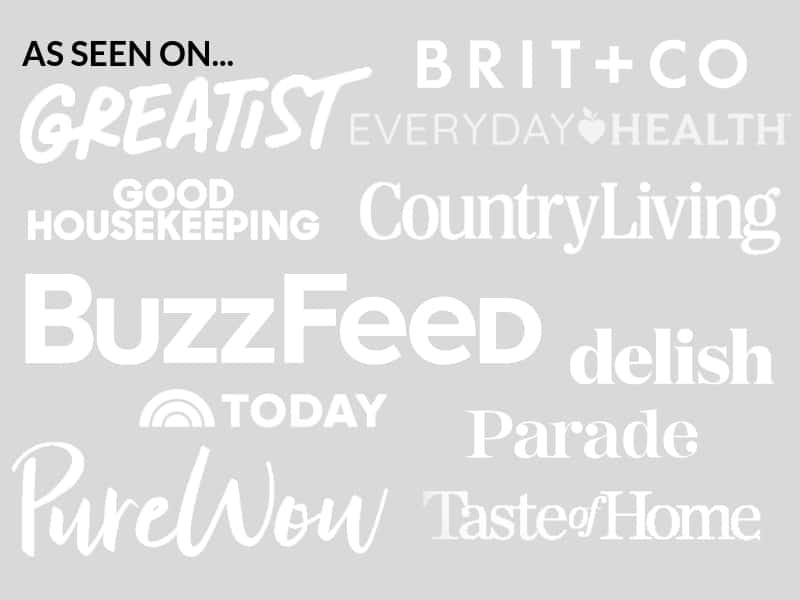 Delish – even according to my grandson-chef! NowI know I can make it just with carrots when the squash is not available. Thanks! Yum! I LOVE butternut squash soup. I bet the orange zest went so well with it! One of my favorite soups! I’ve made a similar recipe and added some coconut milk at the end before blending – Heaven! I wish I had discovered it sooner! It’s definitely one of my favorites now, too. Love the idea of adding coconut milk- will have to try that! Wow Elizabeth, This looks delicious. When I make it I’m pretty sure I’ll up the quantity of ginger and add fewer carrots (that’s a function of where I live — ginger is cheap, carrots are not), but it looks so delicious. And very easy to create. Thanks so much. I wonder if you could sub any orange squash for the carrots? There’s a hard squash here called Kobocha (like Hubbard but more orange in color). Would that change the texture or perhaps the flavor would be off and need other spices? Thanks, Barbara! It’s interesting that carrots aren’t cheap there, since they are so inexpensive in the states! I think subbing orange squash would work really well. The other thing I was thinking that would make it a lot heartier is white beans- it would add protein and be a relatively neutral taste. Both may make the soup a bit less sweet, since carrots have a lot of natural sugar, so you might want to add a touch of honey. Hope that helps! Thanks! I’ll try the beans. It makes it a complete veggie meal.